After 2 surprise presentations, the 3rd event for the main day of our 10th Harp Guitar Gathering was exactly as scheduled. 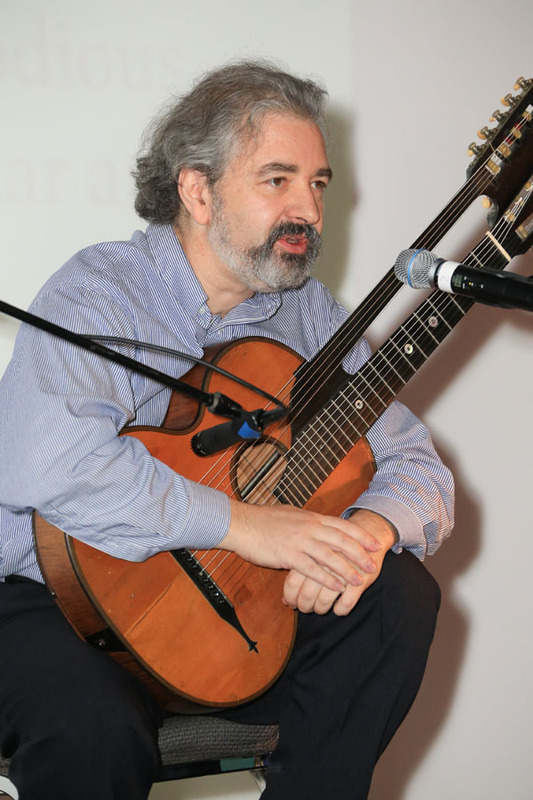 In our continuing effort to showcase all aspects of the harp guitar, including music, instruments and performance practice from different countries and eras, for our 10th anniversary we invited Oleg Timofeyev to share the important “forgotten world’ of the Russian guitar with us. This is a unique instrument and musical culture on many levels, and Oleg has been its leading proponent for many years. For those unfamiliar with it, the Russian guitar’s defining characteristic is its adaption into a seven-string guitar (all fretted), tuned to an open G chord. 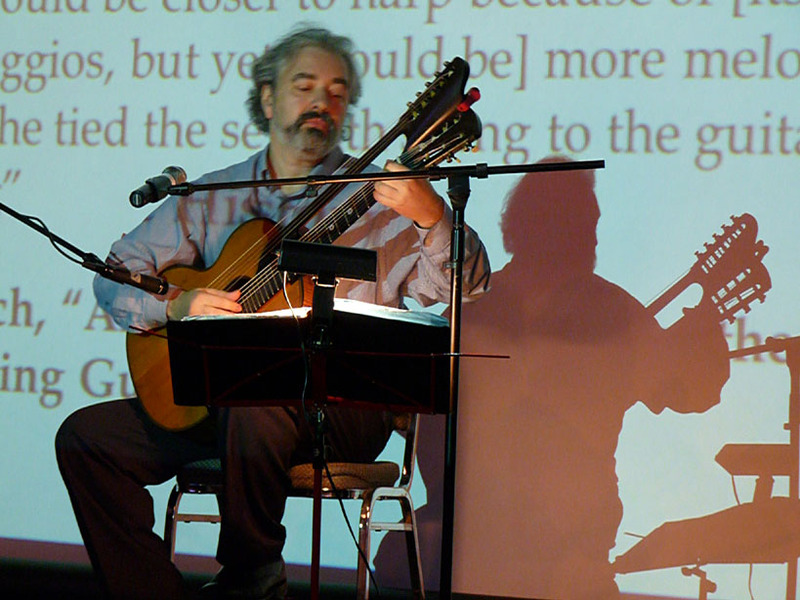 Over time, Oleg added the “harp guitar” version of the instrument to his performances, and also a duo collaborator, John Schneiderman (himself a multiple harp guitar owner/player, who I introduced in a blog a couple months ago). Their stunning work can be heard on their Czar’s Guitars CD. John and Oleg told me that a major multi-disk release of additional Russian guitar music – which now often includes one or the other playing the floating-strings version – is nearing completion! It’s true. The instrument’s practitioners have never thought of it as such, nor used the term. Like their Viennese “floating bass string guitar”-playing “cousins,” Russian builders and players simply referred to the instrument’s total number of strings. In the Russian guitar, it was thus naturally a given that an “11-string,” for example, had four floating basses. As in the Viennese Stauffer/Scherzer-style instruments, it was no surprise nor any real point of interest that the extra strings were floating instead of fretted; that was just what was done in that era. Ergo, to the Russian guitarists, there was nothing “harp” about it. Or was there? Oleg opened his presentation with a slide (presumably included to make me look foolish) that described the 7-string fully-fretted Russian guitar as being originated as a unique type of new “harp-guitar” (I forget his exact wording, but it was quite clever). Not for the extra floating strings it would often incorporate, but for the tuning and playing technique. We all know how the campanella-style technique (cross-string melody line ala “5-string melodic banjo,” for example) makes the guitar sound more “harp-like” from the consecutive overlapping notes. 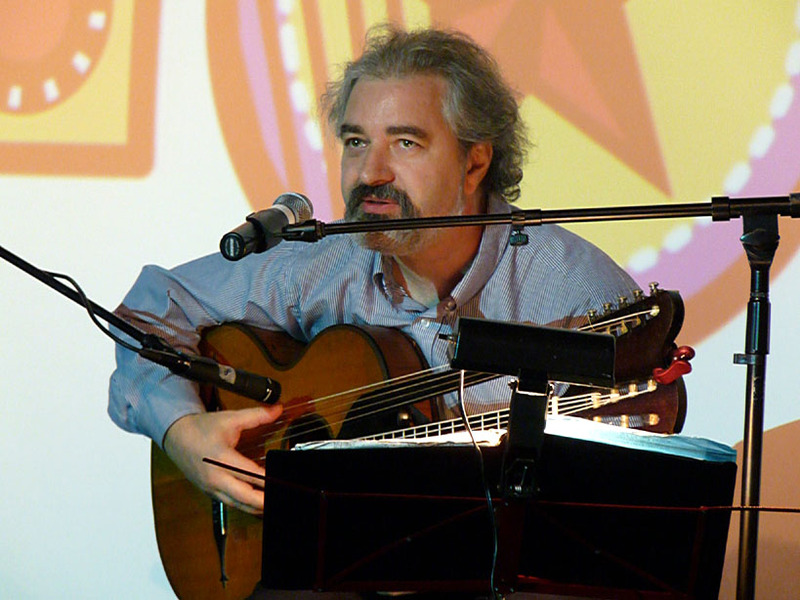 As I understand Oleg, the Russian guitar took this concept further by implementing the open G tuning to facilitate A) more open strings being used, and B) a more harp-like technique of both the left and right hands. Next was Oleg’s explanation of his floating strings (the only reason we let him in the door!). Here was yet another surprise for those unfamiliar with this specialized instrument. The extra basses should not be referred to as “sub-basses” as we generally do for most harp guitars; that’s because they do not descend from the last fretted string (low D), but fill in the gaps around this D and the 6th string G. So they start with an A, above the pitch of the fretted string two strings in on the neck. Next are the F and E to fill the gap between the low D and G fretted strings. Lastly, the 4th floating bass finally gives us the first and only note – C – that is pitched below the neck strings. That’s for the common 4-bass version. Oleg explained that historical provenance specifies 3 basses as the nominal form, but he has found little evidence (instruments or old photographic records) to support this. Instead, he presented numerous pictures (100+ years old) that depicted soloists or multi-member guitar groups, and each guitarist (nary a simple 7-string player among them) seemed to be using a 4-bass, and even more surprising, a surprising number of five-bass instruments, the form Oleg brought along (it nominally adds a lower B). His instrument, a 1912 Eroshkin, was built on the Scherzer design, with a second, separate and similarly domed floating back. Though a gut/nylon-strung instrument, it was amazingly loud and rich over the P.A. system (his normal recitals would generally be acoustic only). 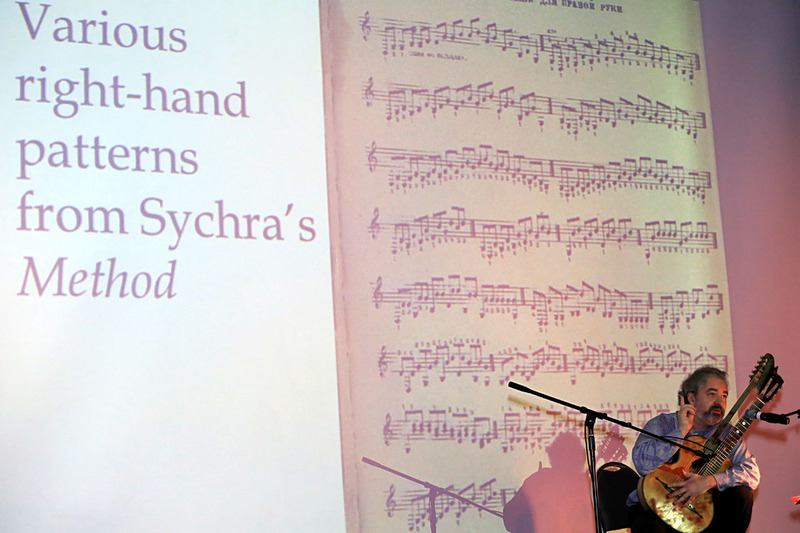 Lest you get the impression from the above that this was a “lecture-heavy” presentation, I must point out Oleg’s delightful virtuosity on the instrument as he played numerous pieces throughout his hour-long spot. I must say how proud I am (we all are) to be able to add this small but wonderful slice of history and forgotten music to our Harp Guitar Gathering archives. Let me profoundly thank you again for inviting me. You are an unusual, extremely positive bunch of people. I really enjoyed myself immensely, and if you ever decide to bring me back, I would be enthusiastic to incorporate a Russian or Russian-Gypsy element in your operation – to create an ensemble number, for example, a potpourri of Russian songs or something. Once again, my gratitude has no limits. 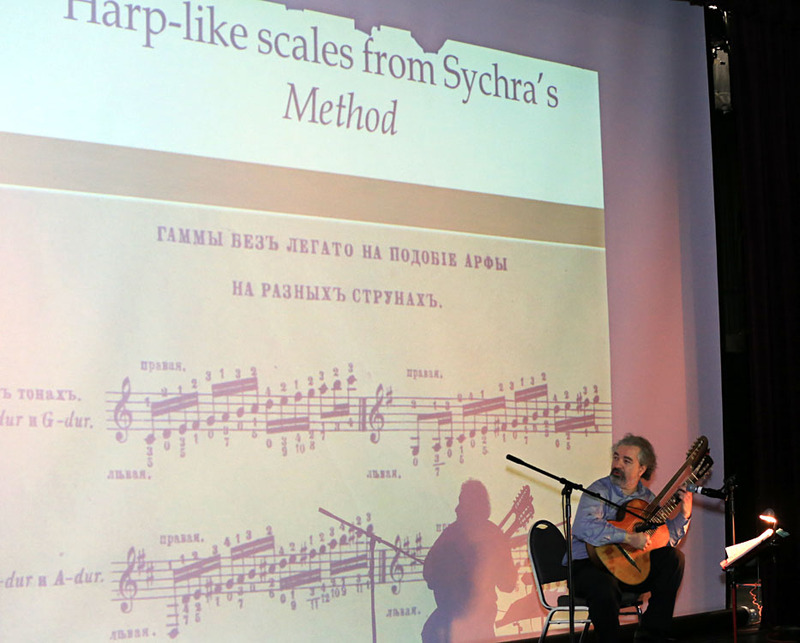 And thank you for coming and sharing your knowledge and music with us, Oleg! Next: The Triumphant Return of Moheji! I also loved Oleg’s presentation. 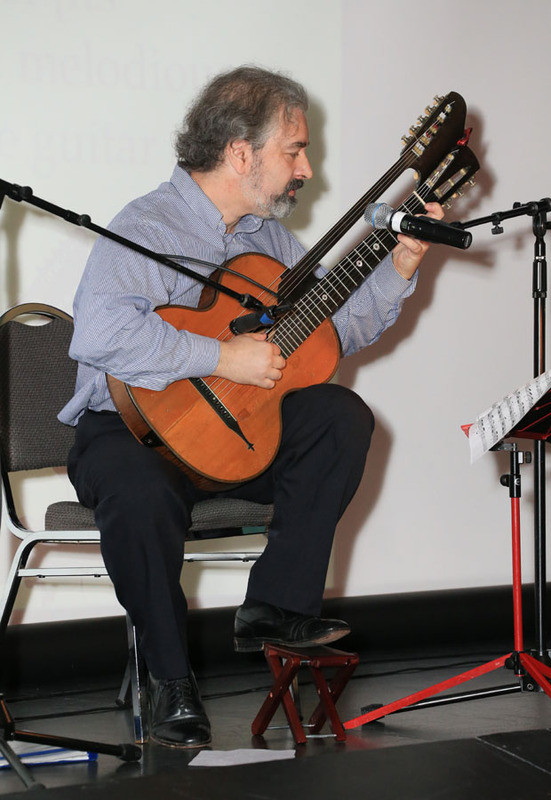 Like Brian Torosian at HGG8, he added a whole new dimension to our understanding and enjoyment of the harp guitar. So Oleg – now that you know the true name of the instrument you have been playing, please come back sometime! And Gregg, I think you paraphrased Oleg quite well.